The year was 1992. 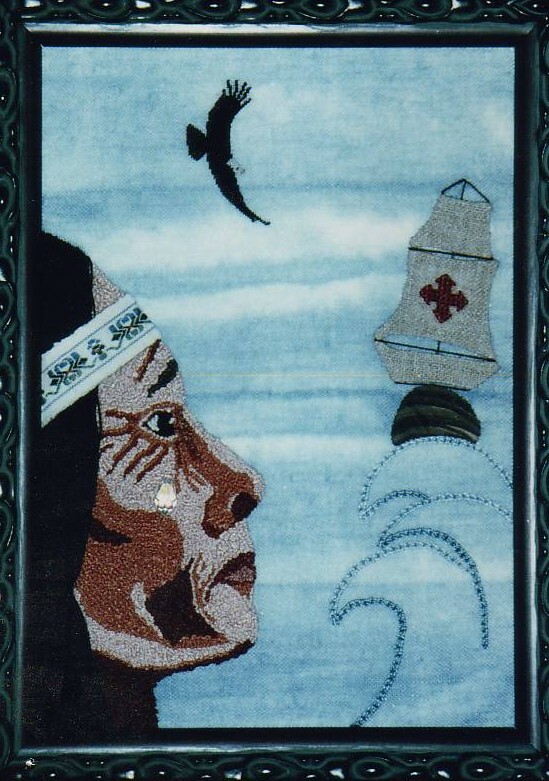 The Embroiderers’ Guild of America had issued a challenge for members to create original works of needleart commemorating the 500th anniversary of Columbus’ Discovery of America. As a descendant of both European and Native people, I simply could not let that challenge lay unanswered. I had to tell the story from the perspective of the Native people. I’m not sure the word “commemorate” was appropriate either. I fully expected my entry to be disqualified due to content and theme. In fact, I already had a letter written in defense of my entry. But I didn’t have to use that letter, because my entry was not only accepted, it received an award of honor. It was displayed prominently and traveled in museum exhibits for several years. I know that it spoke to many people on its journey. They left notes and sent letters. In another blog, in the future, I will tell the story of how this piece came to be, but for today, I’ll just let “Sees Through Time” speak for itself. Sees Through Time, Copyright 1992-2013, may not be reproduced without written permission.